We were nearing the end of our two-week climbing road trip through Colorado, Wyoming and South Dakota. The climbing had been awesome but with the exception of the approaches to Spearhead and Petit Grepon in Rocky Mountain National Park in the early stages of the trip and a short run around Devil's Tower, WY, we hadn't had much cardio during the trip. This fact was weighing heavily on my mind and I was missing running. 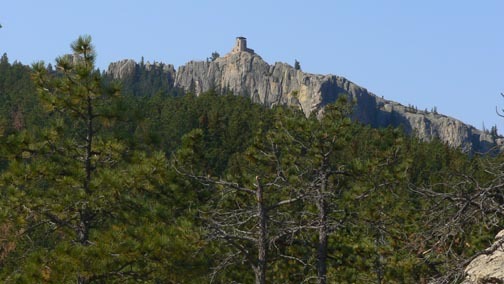 During our visit to the Black Hills of South Dakota and Mount Rushmore we realized we were damn close to the high point of South Dakota, Harney Peak, elevation 7,242'. Just a short distance down the road from our free camping on national forest land was a trailhead that would get us there on a 12-mile roundtrip out and back. Perfect! We loaded our hydration packs and drove down to the Willow Creek Horse Camp trailhead off of highway 244 just a few miles down the road from the Mount Rushmore Memorial. At the trailhead we spoke with two very friendly rangers about the hike. They assumed we'd be overnighting on the trail to Harney but we told them we planned to run the trail and hopefully get back in three hours round trip. Skeptically, they gave us a free map of the area and explained the trails and where we would find water. They also warned us that the trail gets a lot of horse traffic. At 8:20am we set off up trail 8 because the lower portion of trail 9 was closed due to reconstruction. We'd be able to cut over to trail 9 from trail 8 in about a half mile up so this worked out fine. 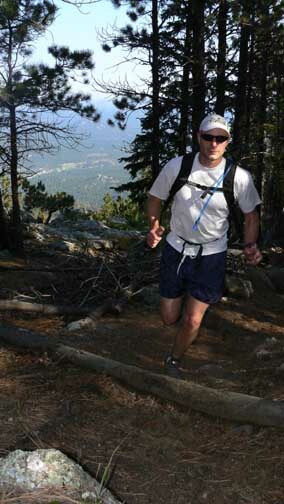 It felt awesome to be running again and I was immediately impressed with the Harney Peak area. Large Ponderosa Pine trees populated the forest and hid large granite outcroppings in the background. The trail was a bit beat up from all the horse traffic but it got much better the further away from the trailhead we got. The temperature was even a bit cool to start but I enjoyed it knowing that it would get much warmer later! The ascending trail paralleled the highway for about a half mile before turning south away from the highway into the Black Elk Wilderness, dropping into a shallow canyon and crossing a lightly-flowing stream before ascending again past a large amount of granite spires and blocks and topping out on a ridge offering a great view into the Needles area. Both Bill and I were feeling great and enjoying the run. The sweat was starting to flow and it felt great! Running! 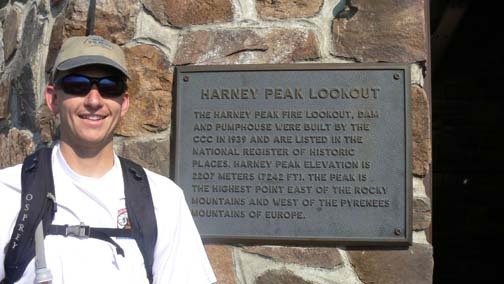 Bill enjoys the view and the nice trail on the way up Harney Peak. We stopped a couple of times to take photos of the surroundings and get pictures of each other running nice sections of trail. A clearing in the trees gave us a great view of the summit of Harney Peak and the large, two-story fire lookout structure built on the top of the peak. We carried on and entered a section of steep switchbacks just below the last half mile of trail to the summit. Knowing the summit was near we upped the running pace and ran past a couple of hikers who were also en route to the summit coming from the shorter, more common Sylvan Lake trailhead. The trail goes up a small set of steel steps and a catwalk just before reaching the interior of the summit house. We checked our watches and had covered the 6 miles in just under 90 minutes. A nice run! 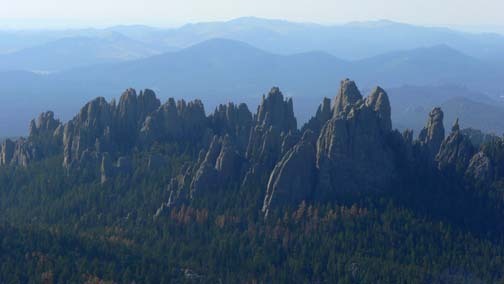 A great view of the Cathedral Spires of the Needles of the Black Hills of South Dakota. We spent time exploring the elaborate stone structure including the dammed area that made for the tower's water source. The tower had been decommissioned tens of years ago but was now a historical structure. It appeared a large amount of time and energy had been spent on its creation. It even had electricity! 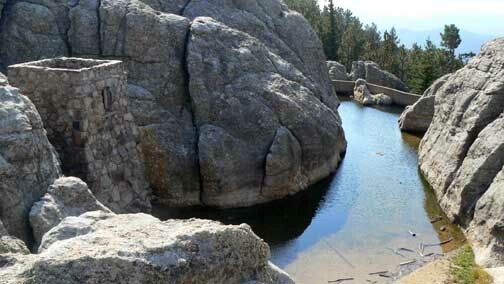 The small pond created by the small dam in the granite rock that was used as a water source for the watchtower on the summit of Harney Peak. Posing by the plaque on the watchtower briefly explaining the history of the watchtower. After eating our summit snack and identifying nearby landmarks in the Needles, we headed back down. Shortly after leaving the summit we passed by a group of four hikers on their way up. As I passed by them, I kicked a rock in the trail and stumbled just a bit. This action apparently really surprised and worried a woman in the group as she shrieked and looked back at me! Obviously she's not accustomed to trail running where things like that happen all time. The run back down the trail was very enjoyable and fast. We passed a couple large groups of horseback riders and two groups of hikers as we descended. Everyone in these groups was quite friendly. We arrived back at the car 58 minutes after leaving the summit feeling refreshed and happy to have successfully ascended another one of the United States' high points! For me, this was my 13th state highpoint and it was a very pleasant surprise! I've climbed all but two (UT and HI) of what I consider the "western states" highpoints and didn't expect much from the other state highpoints. The beautiful forest, nice trail and granite rock summit of Harney Peak was a real treat.